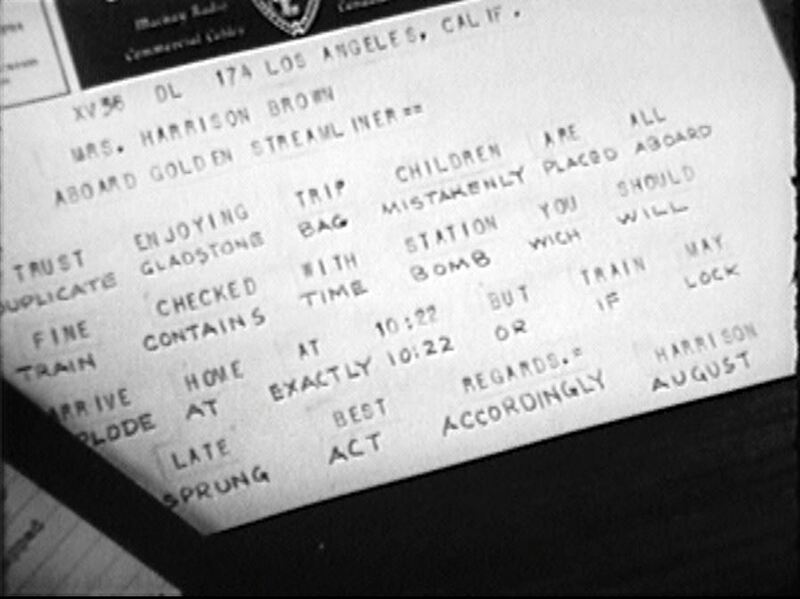 Released during World War 2, Spy Train is a B picture (maybe a C picture) about those sinister German types out to blow up the local train station with a suitcase bomb. 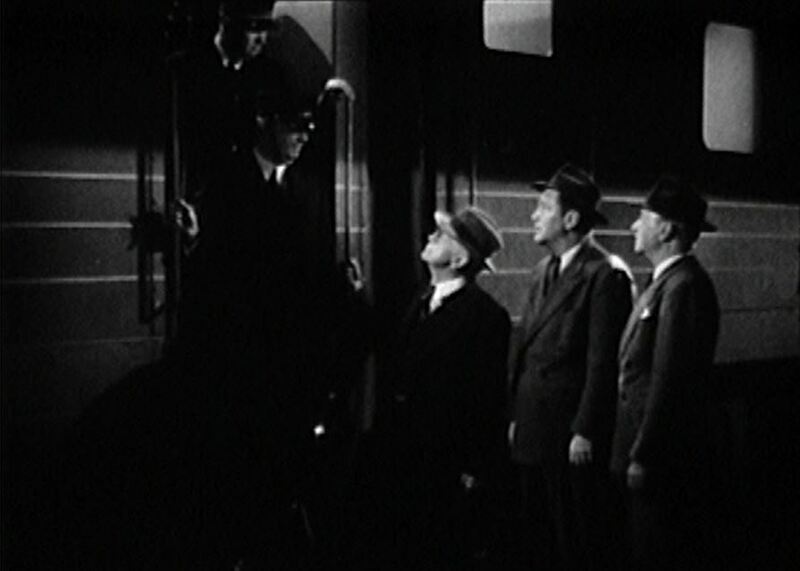 The trouble starts when the Krauts get their suitcases mixed up and it winds up on the train with their Nazi agents (and everyone else) aboard. 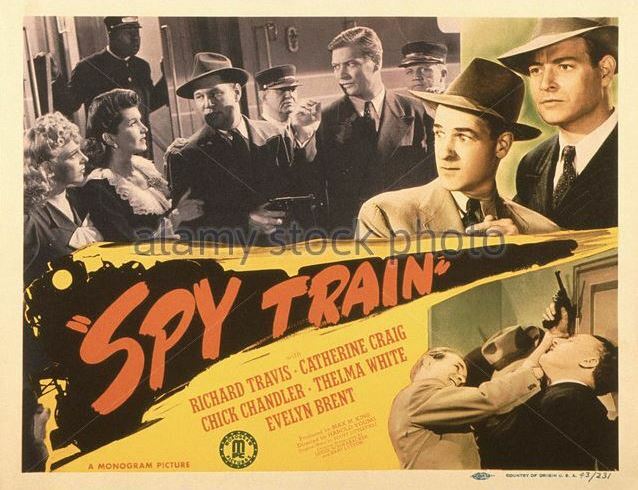 Great faces, great fights — at least in this partially color movie card for Spy Train. 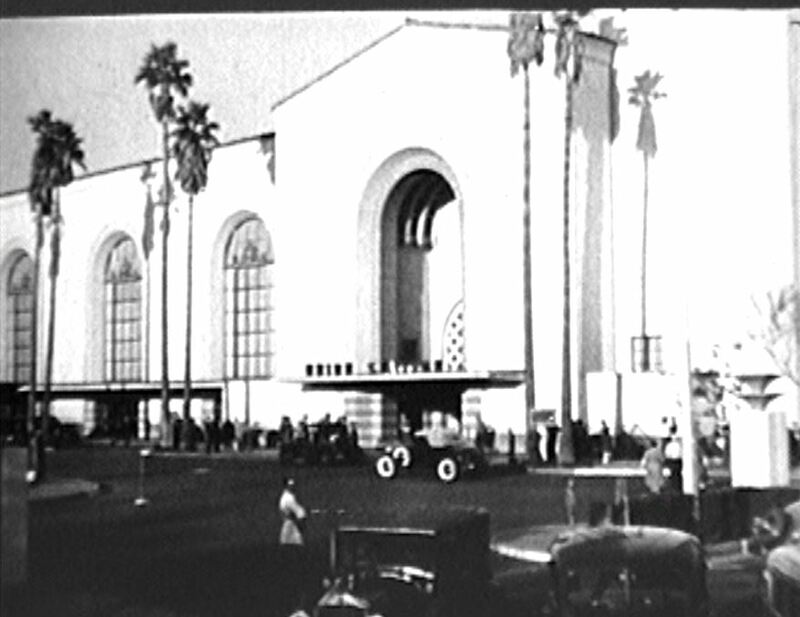 The film opens with establishing shots of Los Angeles Union Passenger Terminal…AND…Pennsylvania Station in New York City. So pick one. 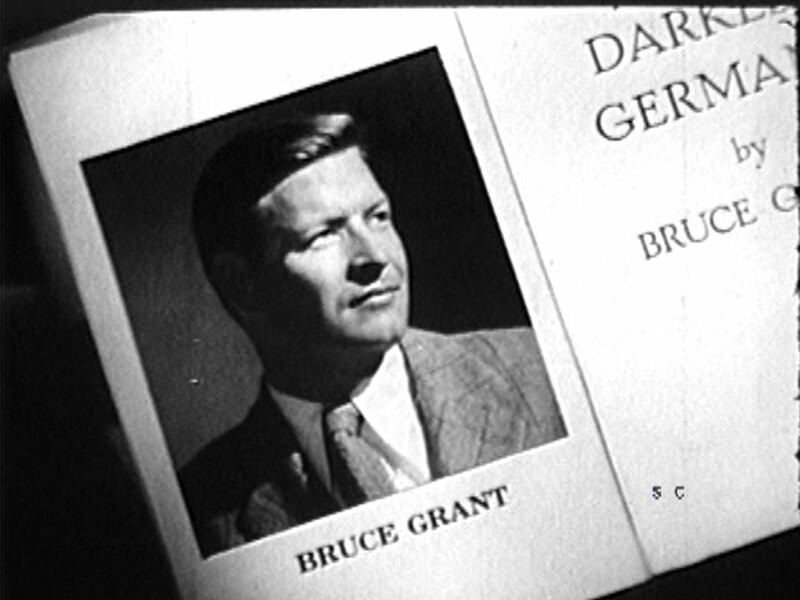 Our hero, Bruce Grant (Richard Travis), author of “Darkest Germany” (a tell-all about his time in Deutschland before the war) is recognized by the station’s book store clerk. Gosh, ain’t he dreamy?? Boooo! 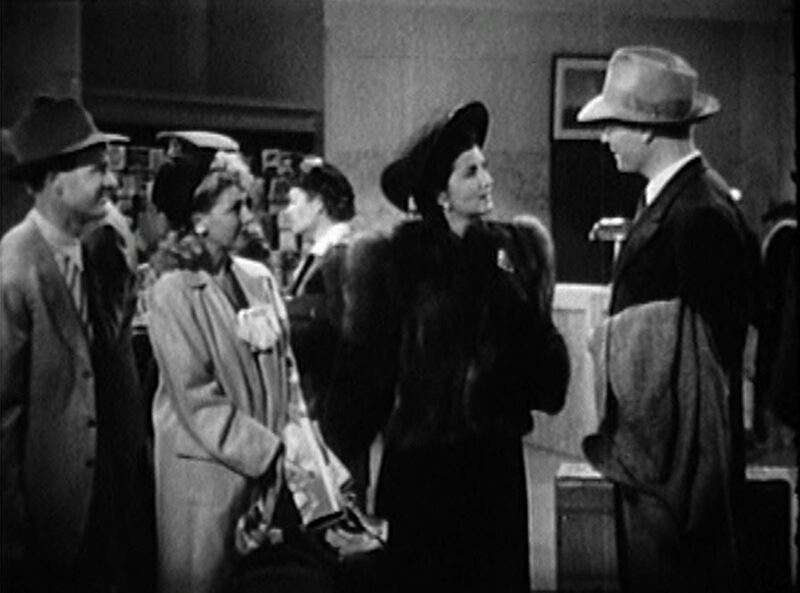 Here’s the two Kraut spies along with their henchman, Gunner; The ditsy blonde acquaintance of Gunner unwitting picks up the suitcase bomb from the depot bag check guy (complete with green visor). Here’s all the “good guys”. 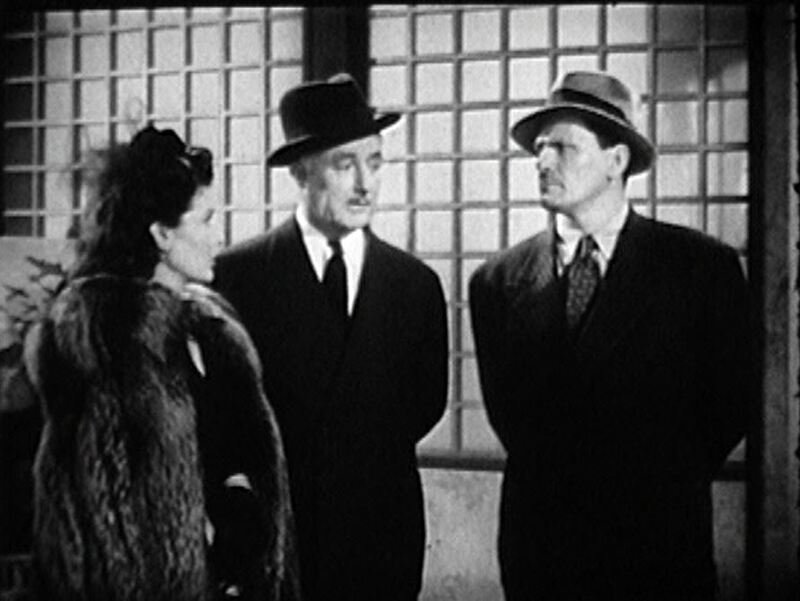 From right to left, Bruce, Jane Thornwall (Catherine Craig) and their respective sidekicks. 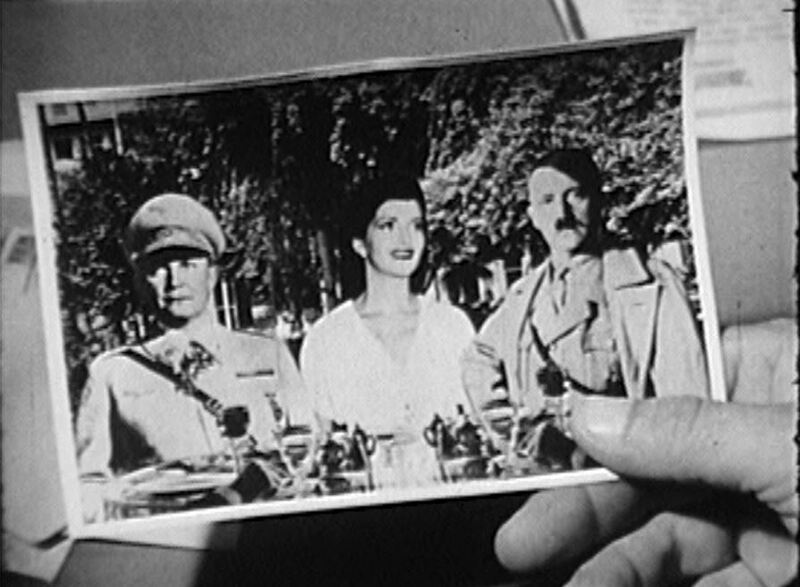 Jane schmoozing with Goering and Hitler! Say it isn’t so! 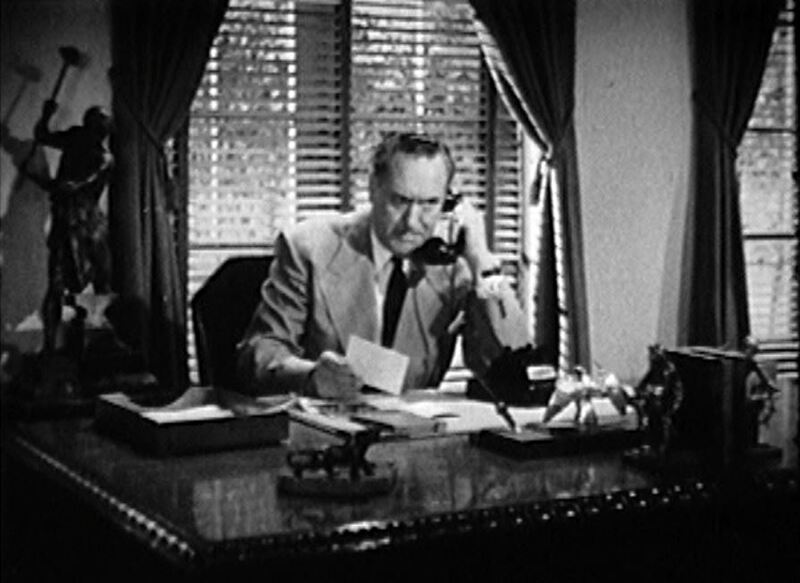 ; Jane’s father Max Thornwald (Herbert Heyes) is not amused with this blackmailing, put-up job. 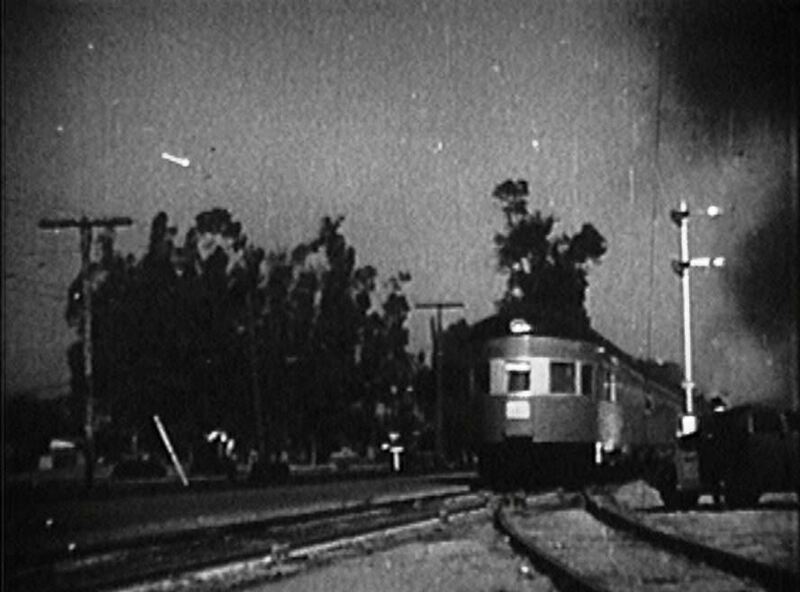 Okay, let’s all get on board the ah…SP’s Daylight train? ; Or is that a Pennsy train with the pinstripes? 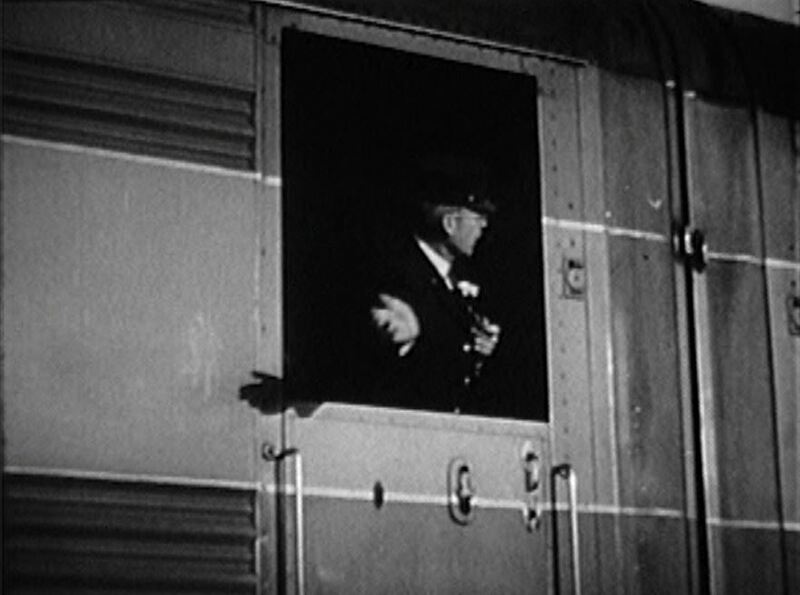 The SP conductor waves a highball and soon the train pulls out past lower quadrant semaphores. 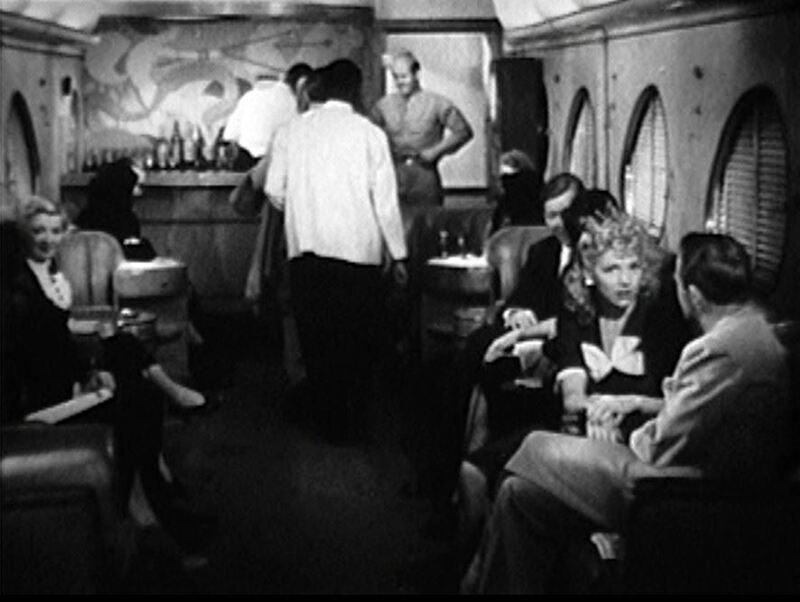 Interior of the train’s lounge car with the oddly-shaped windows; Bruce and Jane have a friendly snootful. Those windows look like they came off a 1960’s-era GM bus. 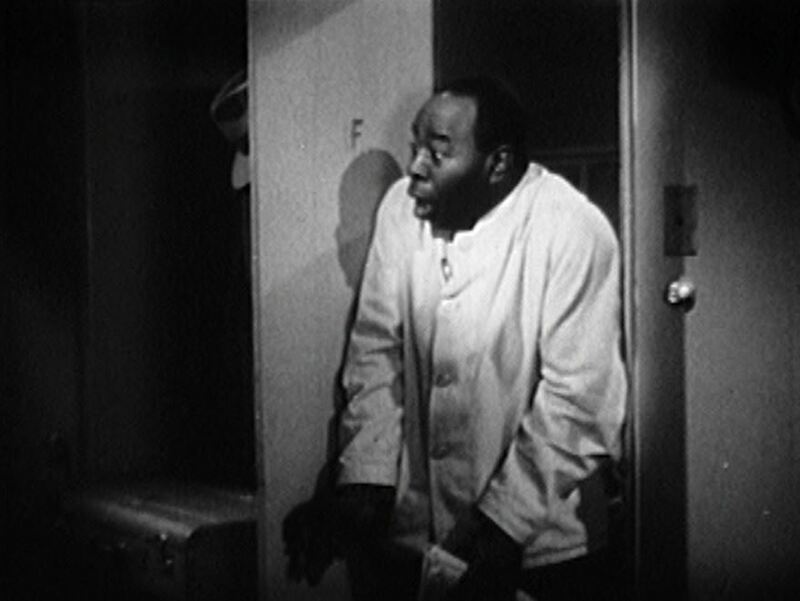 Comedy relief is provided by the only actor I recognized in this picture — the venerable Fred “Snowflake” Toones as the Pullman Car Porter. 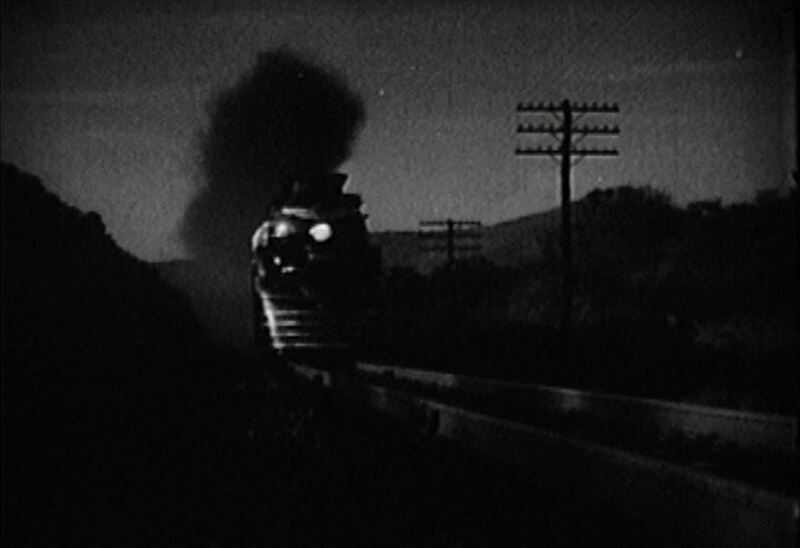 He stumbles upon a murder scene as the now Pennsy train steams along through the night. 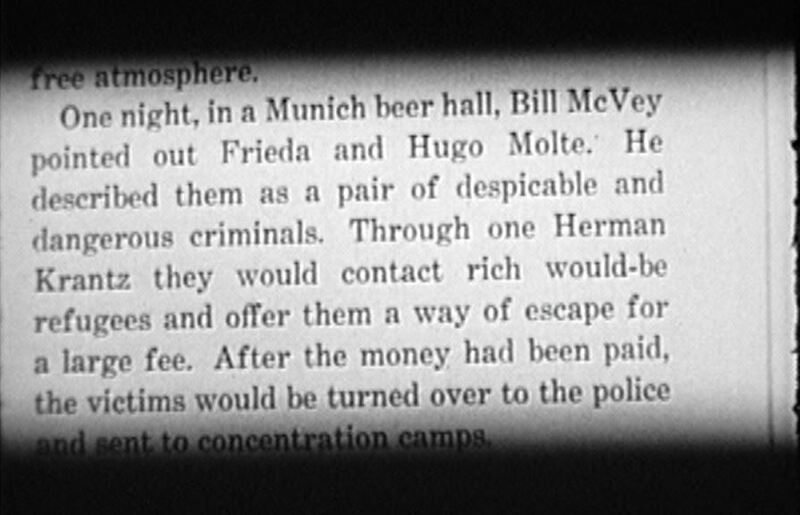 From a passage in Bruce’s book, we find out about the shady past of the Nazi spies onboard. 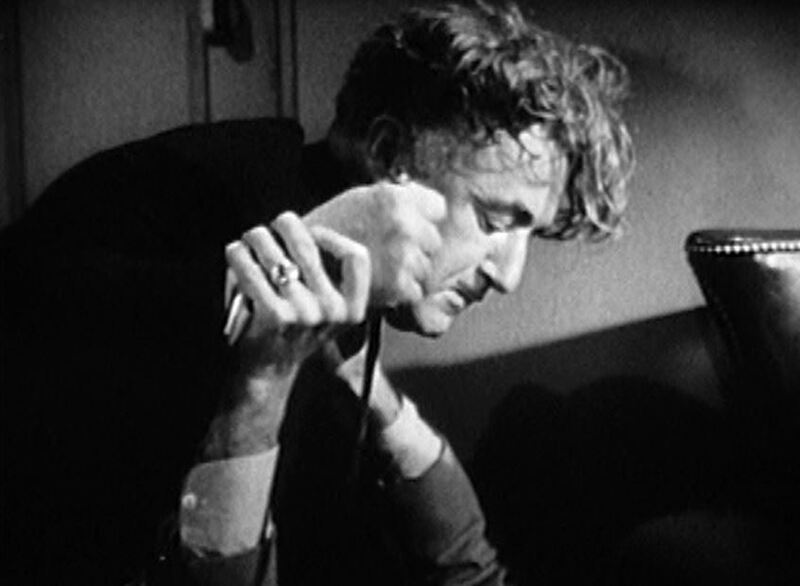 Those…CADs! Look out! He’s got a knife! 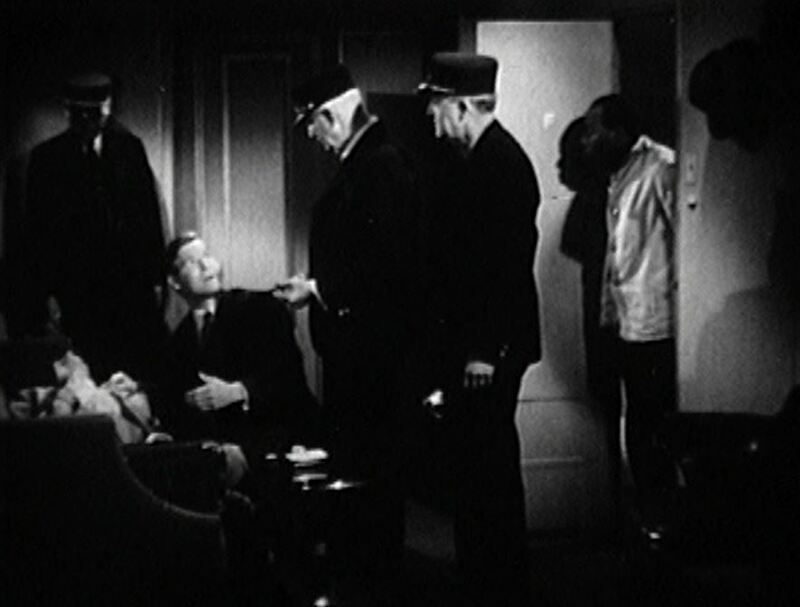 The head kraut is attacking Bruce’s sidekick…and Bruce happens upon the scene in his bedroom, just as the porter and conductor arrive. Ha! Explain THAT Bruce! 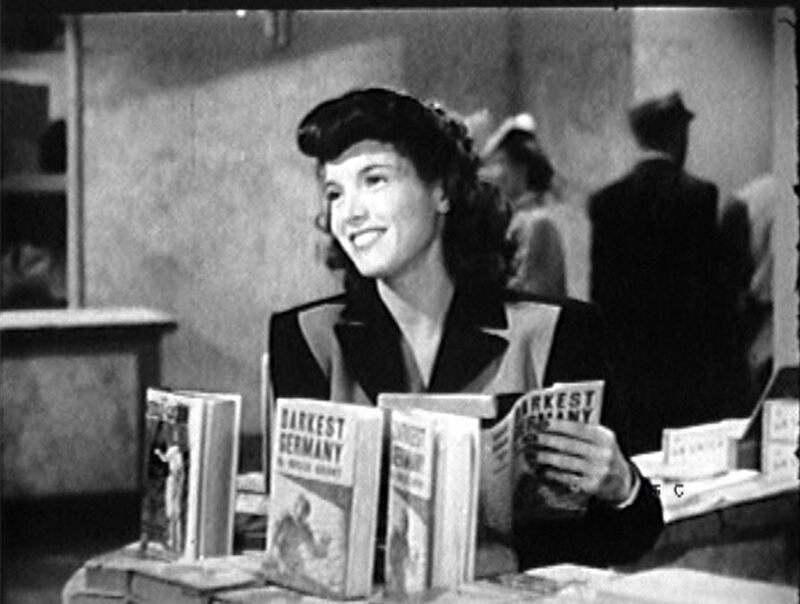 Jane to the rescue! 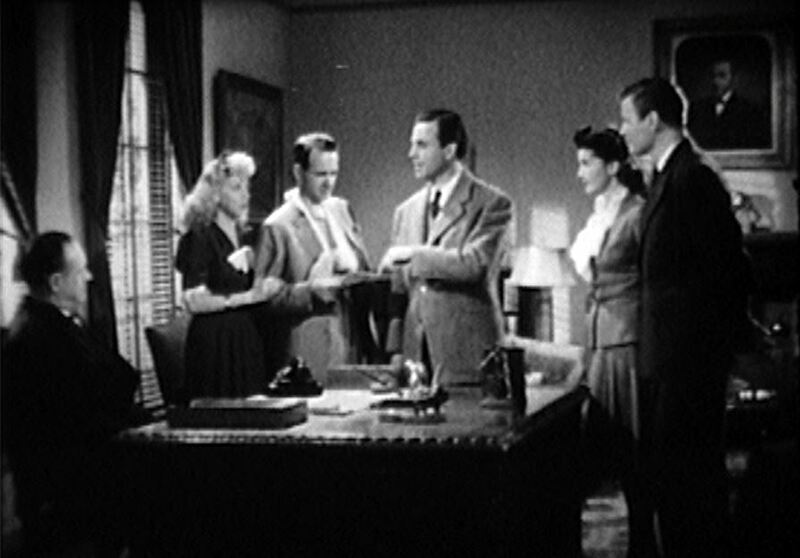 She coolly levels the pistol at the Krauts, whilst Bruce decrypts the telegram. 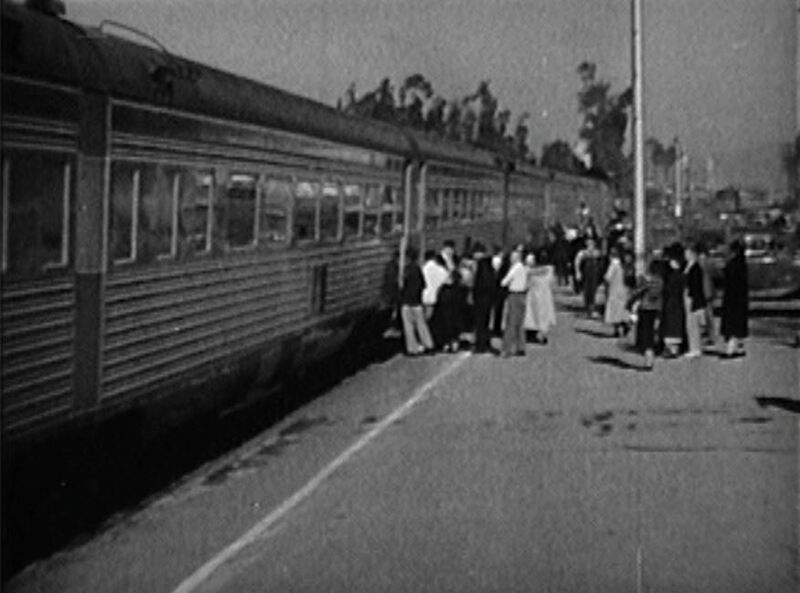 Note: Their train is referred to as the “Golden Streamliner”. It’s almost 10:22pm (when the bomb is set to go off)! 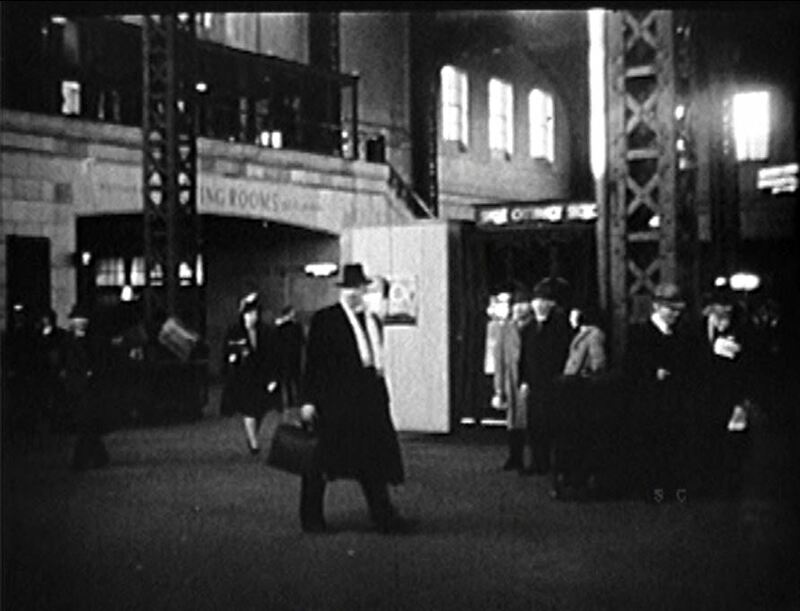 Dummies that they are, the Nazi spies grab the wrong suitcase (again), get off the train and make a break for it; BA-BOOOM! 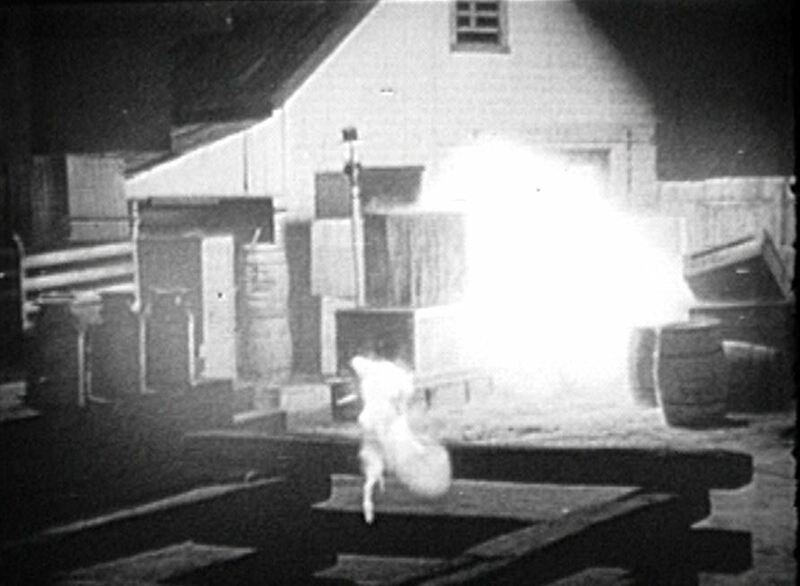 The suitcase bomb goes off sending those fiendish Kraut spies to their demise. 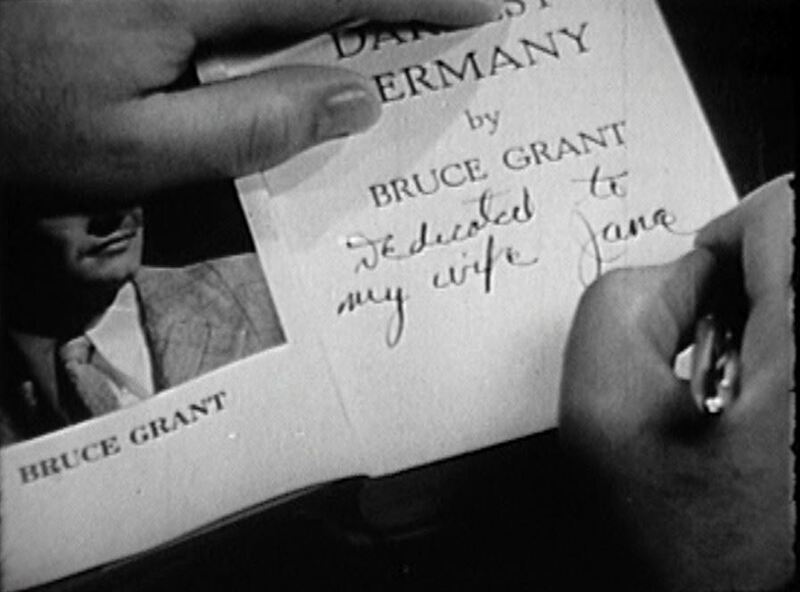 Now everyone’s standing around in Jane’s Dad’s office discussing their perilous adventure; Awwww…Bruce gives a book dedication to his new bride as the picture draws to a close. 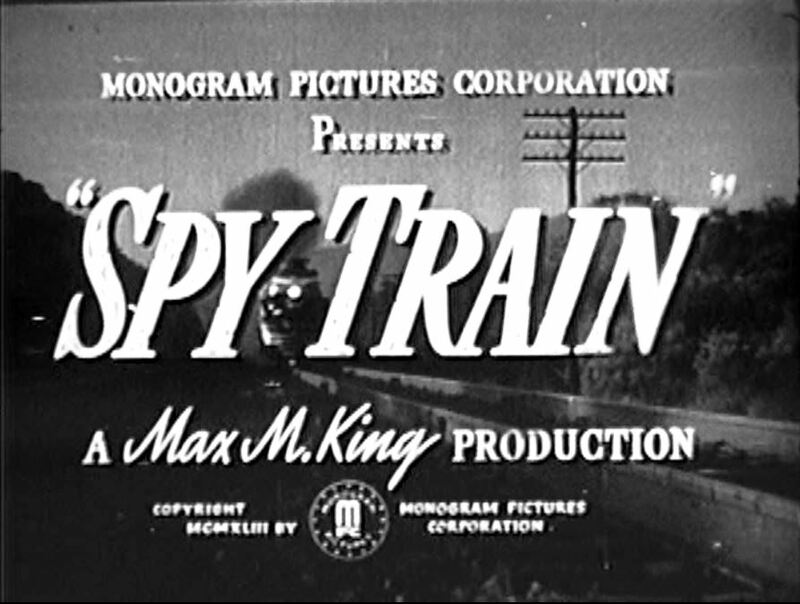 Spy Train is a little thin on the railroad quotient and the story is, frankly, hard to follow. 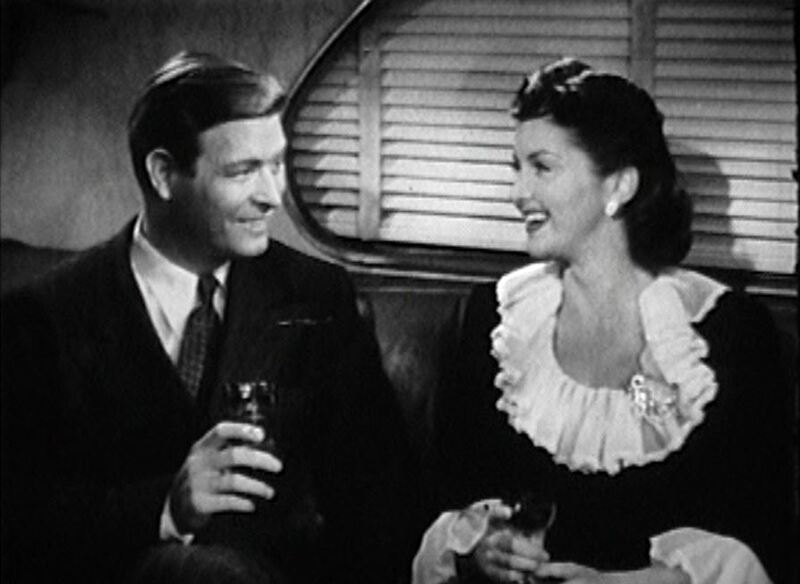 Still, mustn’t let an obscure train movie go to waste. 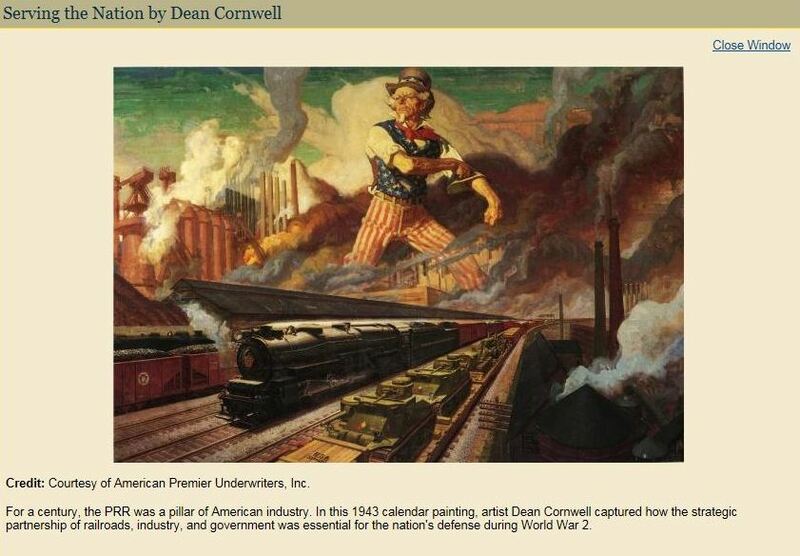 I couldn’t resist this classic WW2 painting where the Americans are battling Germans on the homefront — by rail!. 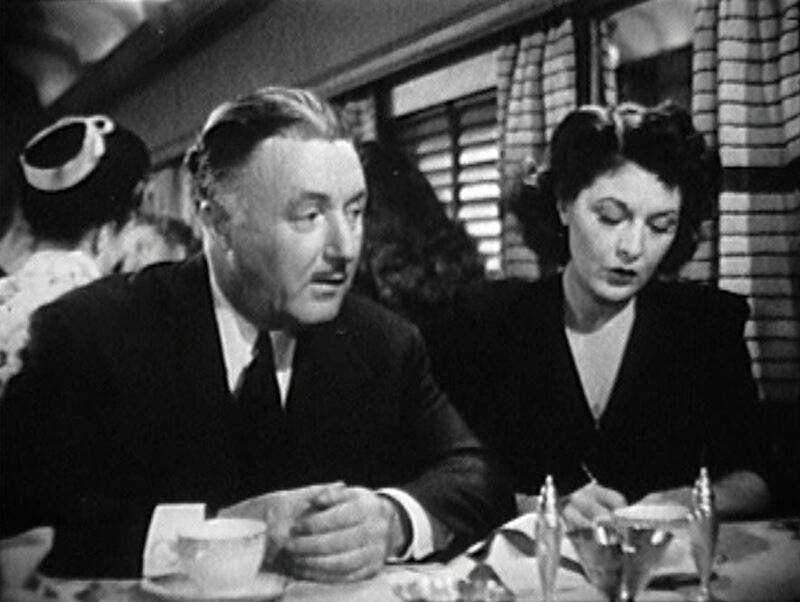 This entry was posted in Uncategorized and tagged Adolf Hitler, Fred Snowflake Toones, Herman Goering, Los Angeles Union Passenger Depot, Monogram Pictures, Pennsylvania Railroad, Pennsylvania Station, Southern Pacific Railroad, Spy Train 1943, World War 2. Bookmark the permalink.